Washington DC. September 25, 2002– Last evening in the Hearing Room of the House International Relations Committee of the US Congress , Irish Americans and Congressional leaders celebrated the 25th. Anniversary of the formation of the Ad Hoc Congressional Committee for Irish Affairs The event was hosted by the AOH. The Committee was formed on September 28, 1977, with Congressman Mario Biaggi (D-NY) as its first Chairman. Fr. 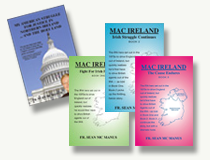 Sean Mc Manus , President , Irish National Caucus, chaired the Press Conference on Capitol Hill announcing the Committee’s formation. Also present at the event was Bob Blancato, Congressman Biaggi’s former Chief of Staff. 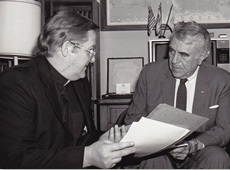 ” Bob and I did some great work together”, concluded Fr. Mc Manus,” and it was really special seeing him there”.